If you are part of the 91 million people worldwide that make up the direct selling industry, then you know access to social media, email, and newsletter tools are key to ensuring steady growth and long-term success in direct selling. Is your company equipped with the digital tools that will give your distributors the edge they need to build a successful business? Do you know how to leverage these tools? 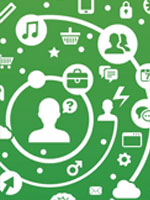 Connecting with customers and prospects via personalized communications is critical. The following are three tips that will help direct sellers get the most out of newsletter programs to position themselves—and their consultants—for optimal selling success.